Chance is taking an afternoon carpentry class at Vo-tech. 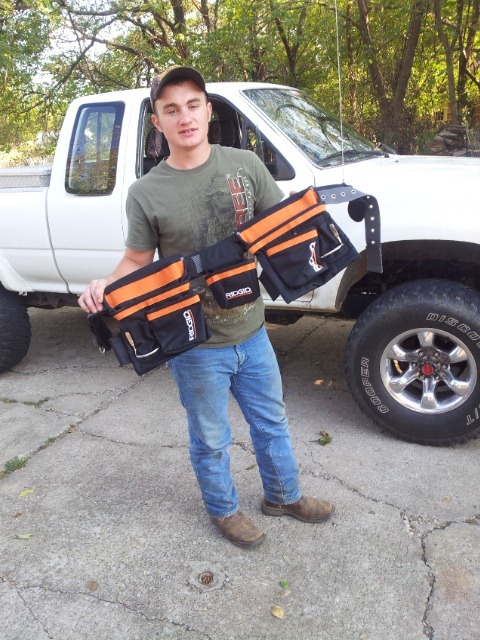 He came home from Tech today with a brand new tool belt. He told his dad and me that he “won” it. I asked him how he did this. He said his teacher announced to the class a couple weeks ago that he would be giving this $100.00 belt away to an exceptional student. The teacher told the class he would base his decision on test grades and performance in construction projects. Chance won the belt. I’m so proud of him. This is a big deal to me because I get some conformation of my decision to homeschool. Lately, I have been questioning my decision to homeschool my youngest child. So this little award Chance received today let me know that I haven’t totally messed up my kids in my decision to keep them home. I need this conformation occasionally. Here’s something else….I had reason to email Chance’s teacher a couple weeks ago. I asked him how Chance was doing in class. I reminded the teacher that Chance was a homeschooled student. I told him I was just curious how he was doing in a classroom setting. He told me that he just calculated the grades on a big math test and that Chance had the highest score of the class. Call me a proud mamma. So, I just wanted to share. Thanks for reading and letting me gloat. This entry was posted in Homeschooling, My Stuff and tagged homeschooling, Kids, life, parenting. Bookmark the permalink. Aw, you should be proud! What wonderful validation! Congratulations, Chance!